This disc gloriously preserves a live series of concerts from Pittsburgh's Heinz Hall, May 9-11, 2008. Manfred Honeck has proven to be a terrific conductor, but this Exton disc is bound to get lost in the shuffle compared to his Mahler and Tchaikovsky on the same label. Whether you want this particular album will depend on how much you collect of the Pittsburgh Symphony; Exton discs are Japanese imports and tend to be expensive. By the same token, they are sonically superb and are of excellent quality in every way (the liner notes are glossy, even). Following a propulsive and dramatic Overture to La forza del destino, Alan Fletcher's Barber-esque Clarinet Concerto is preserved here in its world-premiere performances. The music is easy on the ear but never mundane; there are echoes of jazz and even the blues. Michael Rusinek is a commanding soloist, with a rich tone and a wide emotional range. I'm not quite sure what the work is doing here, but it is nice to hear Honeck in something other than the German and Russian music which has established his career on disc. Oh yes, the Pittsburgh Symphony Orchestra sounds amazing. Let's not forget that the orchestra has always had strong ties to American music, although they don't have very much to do here. I find the first two movements more involving than the concluding Presto, which I find unimaginative. It's the Strauss that I imagine most listeners would purchase this disc to hear. Ein Heldenleben is somewhat of a Honeck specialty, since he and the orchestra brought it to Berlin a few years back. 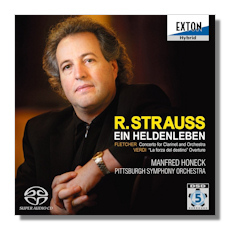 Honeck almost always gives great readings of this kind of music, and his Strauss disc with Pittsburgh on Reference Recordings is equally magnificent. This perfectly-paced, guns-blazing account of Op. 40 confirms to orchestra as an absolute powerhouse. The Pittsburgh brass are some of the finest in the county right now, though truthfully everyone does such good work that it feels unfair to compliment just one section. Certainly Karajan, Bohm, Bernstein, Ormandy…none of them gave us this good of a Heldenleben, and surely not live. Honeck balances the drama and humor effortlessly, with his woodwinds dancing and strings singing. The audience is very quiet. Though the market for complete concerts is questionable, the value of this one is very high, and its production values are very fine too.